They’re not standing around the watercooler, but Cheryl Sadler, Mark Meszoros, Mark Podolski and Nicole Franz are talking about what they’ve been watching, listening to and playing during their free time. 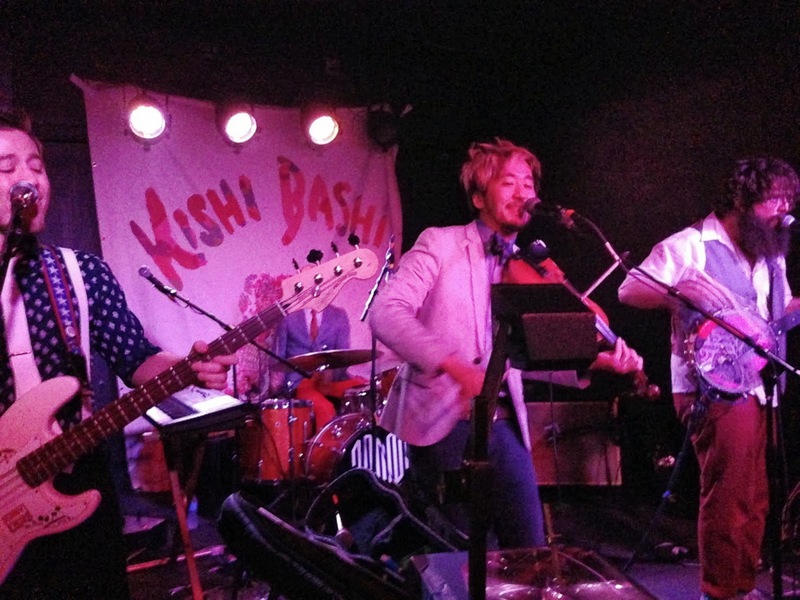 "I haven't felt this alive in a long time," Kishi Bashi sang to a crowd of just about (if not under) 100 in Toledo's Frankie's Innercity - a '40s Italian eatery turned dive music gem. And we sang along with him because after four hours of brilliant muisic, we felt the same way. Bob Boilen of All Songs Considered -- my favorite music podcast and source of anything I know about groovy tunes -- listed Kishi Bashi in his favorite songs of 2012 and continues to highlight his work when he comes out with something new. Thanks to Boilen I caught on to the act and made the trek to Toledo, got lost temporarily, and was eventually very glad I did. I think Kishi Bashi's looking at me in this one. In the foreground you can see the old-school (literally old and from a school) projector that they used for visual effects later on in the show. The smell of clove cigarettes wafting in from the back door made me feel like I was in college again except that what my friend (who I dragged the 2.5 hours from Cleveland) and I were about to experience was anything but sophomoric. Tall Tall Trees took the stage after local band Ottawa's set. Ottawa had some great intentions, a nice mix of sounds and emotions and a whole lot of passion. Not to mention, it was great to see a local band opening for national cult-favorite Kishi Bashi. Mike Savino - out of New York City - is Tall Tall Trees. He's a one-man kaleidoscope of bluegrass, Bon Iver, Avett Brothers, Feist-like visual effects and audio looping, Zach Galifianakis (see beard above) and his own brand of awesome. If your child playing makebelieve was also a boss on the banjo and a master of sound engineering foot pedals, you'd know what Savino's performance was like: astounding. The banjo head became a drum that provided driving tribal beats sending the audience into the stratosphere. The pot became an echo chamber for live vocal bending or amplification of those little spaceship sound effect machines we used to use as a soundtrack to any space-age mission we were on in Gradma's upstairs play room -- "peew-peew!" He even uses a bow across the strings -- the man is like an electronic Burt from Mary Poppins. Also, his banjo lights up. Replace the banjo with a violin and you've got something close to an inkling of what Kishi Bashi does. Kaoru Ishibashi was born in Seattle - of course - and grew up in Virginia, according to Wikipedia. The classically-trained violinist has performed with well known artists such as Regina Spektor, of Montreal and Jupiter One. Now he's doing his own thing. And it's my favorite thing. I can't stop listening. Beyond his talent accounting for his rising popularity, his recording label Joyful Noise knows exactly how to make a boy excited: toss a Now and Later and a bunch of artist swag in with your album purchase. On stage, Kishi Bashi and Savino played together for a majority of the show and were joined by a super talented drummer and bassist, the later who sang unassuming harmonies the entire show and then shocked the audience with an outrageous (in a good way) screamo finale that made everyone giddy with surprise. Take a listen and, if you like uplifting sounds, ingenuity, uncontrived uniqueness and true talent, it might be your favorite thing too. And I'm off to download everything ever recorded by Tall Tall Trees. Oh, and Kishi Bashi is releasing a new album in the spring. He played several songs from it last night. Don't be jealous, be excited. Play Emmys Bingo while you watch the show Sunday night!